Do Your Mutual Funds Outperform the Market? Do you pick the best active mutual funds? The ones that outperform year after year? If you do, you are probably in the minority. That’s not to say that you have a flawed selection process. On the contrary, you could have a wonderful system in place to choose the best funds. It’s just that the system in its current form has the deck stacked against you. Active mutual funds come in all shapes and sizes. They invest in every category imaginable across the various markets, geographies, sectors and investment styles. According to the Investment Company Institute, the number of mutual funds worldwide increased to over 7,600 by the end of 2011 from only 564 on 1980. You can also add to that a total of almost 1,200 ETFs (a number that rises with each new investment fad). The sheer number of mutual funds makes it difficult to choose wisely. Most people assume that an increased number of choices allows you make more informed decisions. However, research shows that more and more choices can be debilitating. This is one of the reasons investors have such a hard time making the correct decisions. In 2012, for active U.S. stock mutual funds 63% of large-cap funds, 80% of mid-cap funds and 67% of small-cap funds failed to outperform their index benchmark. Over longer time periods the results aren’t any better. For the three year period ended 2012, 86% of large-cap funds, 80% of mid-cap funds and 67% of small cap funds underperformed. The five year numbers are 75%, 90% and 83% of underperformance, respectively for large, mid and small-cap active mutual funds. These are just U.S. stock mutual funds, but the performance of stocks in global, international and emerging market funds was not much better. A similar pattern emerges for bond funds as well. The one outlier was international small-cap funds where the 1, 3 and 5 year numbers showed only 15%, 10% and 21% of active funds underperformed their benchmark. 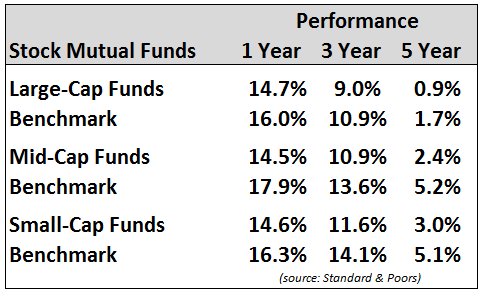 For the majority of these numbers you should notice that the number of active mutual funds that outperform gets lower as the period of time lengthens. It gets harder to outperform the longer your time horizon. You would think that the index (benchmark) would be the average return for a market because half of investors should outperform while the other half should underperform. That makes intuitive sense. But as you can see from these return numbers this is definitely not the case. The indices are doing much better than 50% of all funds. The active mutual funds are getting routinely beaten over time by simple market indexes. So why are the active manager results so poor when compared to a market index? There are a number of reasons, but the biggest one is costs. Active mutual funds charge much higher costs than simple index funds. According to the Investment Company Institute the average annual fees on stock funds are 1.44% and bonds funds average 1.02%. In comparison, all Vanguard funds average an expense ratio of only 0.19%. Most index funds offer similar low costs. That’s a pretty big difference that the manager has to make up through investing skill. There are many very good investors running mutual funds but over the long-term it can be very difficult to make up that difference. One of the ways they try to do that is through more active trading. This increases transaction costs which make it even harder to beat an index fund (index funds trade infrequently, thus lowering costs). Most mutual funds don’t start attracting money until they show good performance figures. But once they do have a solid performance record the money really flows in. Having more money is to invest makes it harder to find worthwhile investments. That is what Buffett is telling us in his quote. He could have higher returns if he was managing millions instead of billions. Once they hit billions in assets it is much harder for portfolio managers to be nimble and find the most inefficiently priced investments. You can find great mutual funds managers that will outperform their benchmark. It will just be very difficult to do so. Plus they are bound to have periods of underperformance which will make it harder to stay with them over the long haul. One of the greatest mutual fund investors of all-time is Peter Lynch. From 1981 to 1990 his Fidelity Magellan Fund earned a 21.8% annual return versus the S&P 500’s 16.2% (still pretty solid) return. But the actual investors in his fund only earned 13.4% in that time frame because of their poor timing of buying when the fund did great and selling when it did not do as well. This is another unfortunate case of irrational investor behavioral wreaking havoc on investment results. Add this all up and you will likely have better performance over time investing in simple index funds. As you can see from the performance numbers above, diversified, low cost index funds have been a proven investment strategy over active mutual funds the majority of the time. Why waste your time trying to pick the best funds year after year when you can play it safe and still outperform the majority of mutual funds out there? Unfortunately, if your main source of retirement contributions is through a workplace retirement plan like a 401(k), you may not have the choice to invest in a wide range of diversified index funds. The fund companies make much more money off of the expenses in their active mutual funds. You can find index funds with a low-cost fund provider by opening an IRA account but you still need to contribute to your 401(k), especially if you are getting a company match. For this reason I will have a follow-up post in the coming weeks with a process you can use to pick active mutual funds if you have to. Do you use active mutual funds, index funds or ETFs? Feel free to share your thoughts on your approach. I currently have mutual funds in my 401k, and I am trying this thing where you don’t check it very often 😉 That might change later on, but I currently have it in three different baskets of mutual funds. Just wanted to ask if you licensed the Dilbert comic you used? I am asking because I looked into using it on a post and saw you had to license them if you planned on using them on a commercial site. I would recommend at least once a year to see how they are performing vs. an index. I don’t sell ads or products on this site so it’s non-commercial. I actually have seen Dilbert comics used on other blogs before that were commercial sites but I don’t know what the arrangements were. I see on the Dilbert site that it does say non-commercial use only.